There’s been fair bit of heat directed at almonds over the past while, particularly given the current publicity surrounding the water situation in California. But, do almonds really use more water than other, animal-based products? Do they really deserve all the flack they’ve been getting? Almonds and Water Use – What’s the Scoop? California’s Drought – Who’s Really Using all the Water? Although beef uses more water during production than almonds, are there other negative effects of current almond production? A note: The above article references this article regarding bees, but do note that organic versus conventional methods of farming are not mentioned. Various pesticides and fungicides used in conventional farming are known to be quite deadly for bees. Another reason to eat Organic produce. Read an article regarding organic food production, that also mentions bees. Clearly, water usage is an issue and more water needs to be conserved. But what is the most effective way to accomplish this? It could help to reduce the amount of water used in almond production, thus possibly reducing the amount of almonds produced during tougher water shortage periods such as presently experienced in California. Although this reduced water usage may help, somewhat, it could seriously affect the almond industry long-term as crops take years to mature. However, California is also a top five state in the USA for ‘cattle production’ (see Beef Industry Statistics) and beef uses far more water in order to produce one pound of product (see image below and read Meat Makes the Planet Thirsty). Note: Almonds use approximately 1 gallon to produce 1 almond, which equates to 377 gallons of water per pound compared with 2463 gallons for a pound of beef. 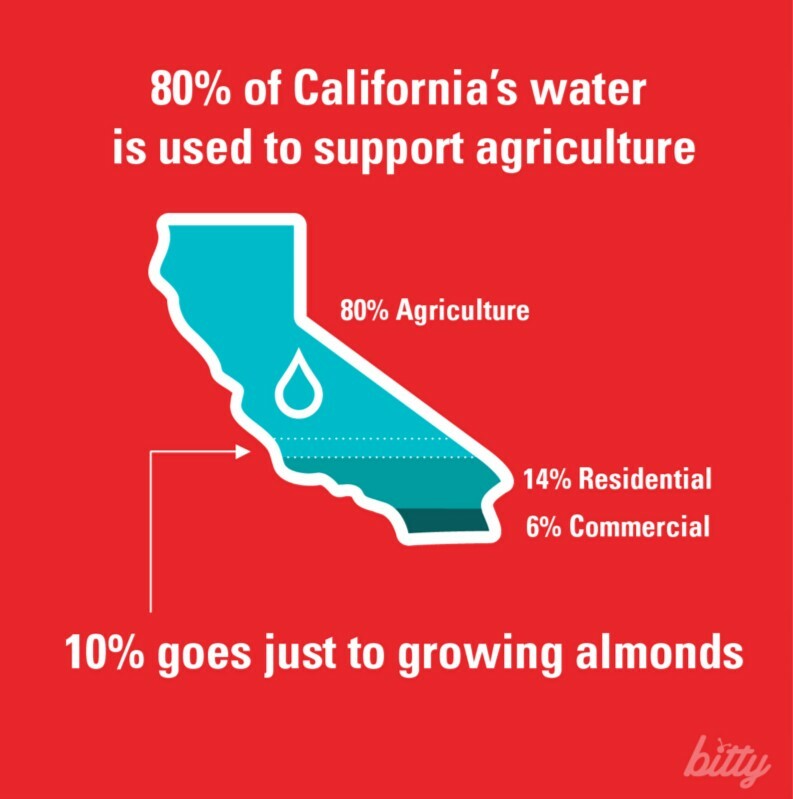 Additionally, as in the article, California Goes Nuts, almonds are often being blamed for their excess use of water, in part because they are being grown in some of the driest parts of California (see image below). However, what is seldom mentioned is that some of the farms with, historically, the most cows are located in that same region of California (see image below, which is featured in Who Let the Cow’s Out). Note: Notice the black area, smack in the middle of California that corresponds with the driest area of the state. Note: This is a different map of California’s driest areas last year (2014), yet, again the dark areas over-lap with the top cattle producing area. Although almond production should not necessarily be excused from its’ water usage, as it does use a fair bit of water – although not as much as residential usage (see the image below), yet what about the other 70% of water that is ‘unaccounted’ for (again, see the image below)? Shouldn’t this 70% also be addressed? And, as beef production makes up a large portion of this amount and uses considerably more water per pound of ‘product’, doesn’t beef production and consumption at least warrant mentioning? The effects of current cattle production on the environment are well known, so maybe we should at least try changing something about it, as is suggested in What if Everyone in the World Became a Vegetarian? Consequently, it would be far more effective if California were to lay off the burgers as well (see: Keep showering California. Just lay off the burgers & nuts), rather than only using hoses with shutoff nozzles to wash their car (see: State Water Board Drought Year Water Actions: Emergency Conservation Regulations). Just some food for thought. Conserve water, by laying off the beef. And, as always, read numerous articles and use a variety of sources to acquire information, in order to get a better idea of the issue at hand. Don’t just take someone’s word for it. Get informed. Form an educated opinion. Never be closed off to entertaining new information or seeing something from a different perspective. And, most importantly, take action. Do something about it. Knowledge is power, but only if you ACT on it. We, the people, have the power to change the world. But, first, we need to realise it! Spread the vegan and plant-based message. Let’s make this world a better place, because it certainly is worth standing up for! Read a film review of Blue Gold: World Water Wars, a documentary about water and our use of it. And read a review of COWSPIRACY, and learn more about how going vegan can help the environment! Find other books and films about the environment. SIGN UP for TheVeganJunction Newsletter to stay up-to-date with the latest news & info!